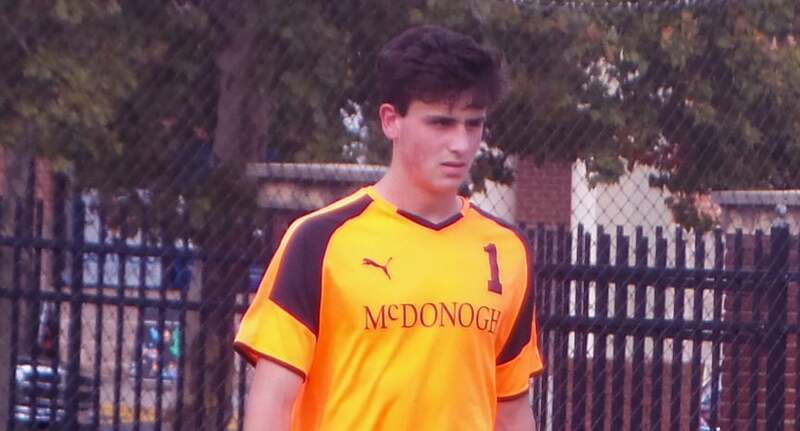 Canadian born senior goalkeeper Kieran Baskett, who transferred to McDonogh prior to his junior season, turned in a sensational six save performance, under the lights at Calvert Hall, Friday night, and helped the top-ranked Eagles survive with a 1-0 overtime victory. No. 7 Calvert Hall (3-2, 2-2 MIAA A) applied heavy pressure for large stretches of Friday’s tense battle and could have walked away with the victory in regulation, if it were not for several stunning stops by Baskett. In the extra session, Kyle Brown final broke through for the Eagles (3-0, 3-0 MIAA, with an assist from Andrew Privett to keep McDonogh undefeated. At Archbishop Curley, No. 2 Loyola remained unbeaten as well (3-0, 2-0 MIAA A) with a 2-1 win over the Friars (1-3, 1-2 MIAA A), who fell for the second time this week. The Dons opened up the scoring midway through the first half when Chase Llewellyn ran on a pass from Massimo Tschantret to finish a 1-on-1with Curley goalkeeper Michael Caulkins. In the second half, the Dons went down a man with 18 minutes left in the game when Llewellyn was issued a red card, but Loyola still managed to double its lead to 2-0 with a goal from Chase Webert after a nice combination down the left hand side. Dominic Caltabiano found Webert crashing the box for the eventual game winner. Curley pressed hard for the last ten minutes and Dylan Sloan finished a nice header to get one back for the Friars. On the road in Irvington, Gilman picked up its first league win of the season defeating No. Mount St. Joseph, 2-1. Tyler Martinez and Logan Paff each scored for the Greyhounds (2-2, 1-1 MIAA A) and Jack Stuzin had an assist. Both Gilman goals came in the opening half. Tyquan Stroud got an unassisted goal for the Gaels (1-1-1, 1-1-1 MIAA A) in the second half to make things interesting, but the Greyhounds escaped Irvington with the three points.